It is that time of the year again when you file your income tax return. With the income tax department getting tough on defaulters, it's best to mention income from all sources in the return form. Many people make capital gains from stock and mutual fund investments. An individual who has sold shares or mutual fund units in the previous financial year must mention the gains, if any, in the return. While doing so, he must remember the following points. It's better to get the figure from a trusted source. Mutual fund investors can get the capital account statement on demand from the fund house. However, some fund houses send the statement after the end of each financial year. Alternatively, one can go to the websites of Registrar and Transfer Agents such as CAMSOnline and Karvy and get the statement through their mailback services. All you have to do is enter the email id registered with the fund house. However, it is not easy for investors in direct equity, as not all brokerage houses give the statement. Alok Aggarwala, senior vice president and head, Just Trade, the online share-trading platform of Bajaj Capital, says, "It is not mandatory for brokerages to give capital gains/tax statements. However, as part of value-added services, most reputed brokerage houses give capital gains statements at regular intervals, usually at the end of the financial year." However, when we checked with some well-known brokers, they said they did not give such statements. So, what can an investor do in such a case? He can seek transaction details from the brokerage and calculate the gains made during the year. If you have made capital gains during the year, you need to fill ITR Form 2, as Form 1 is only for income from salary/pension, one house property and other incomes (excluding from lottery). 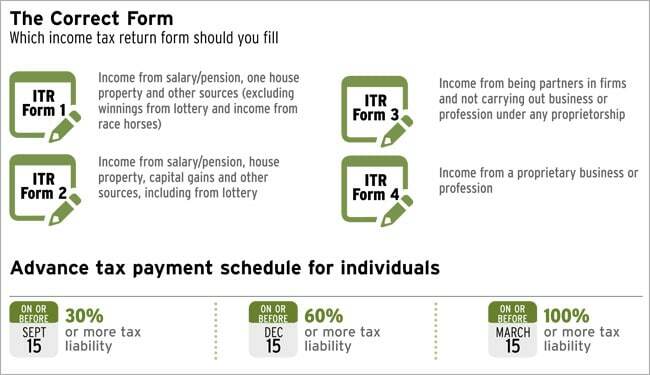 ITR Form 2, on the other hand, is for declaring income from (sources other than the one declared in Form 1) capital gains, all house properties and other sources (including lottery). If you have made capital gains during a financial year, you need to pay advance tax, partially or fully, depending upon when the gains have been realised. "If the gains are realised before September 15, one has to pay at least 30% of the total tax on or before September 15, at least 60% before December 15 and 100% before March 15," says Kuldip Kumar, executive director, tax and regulatory services, PwC India. If the gains are realised after the dates mentioned above, the payment should be made as per the next schedule. If an individual fails to do so, he/she has to pay the tax along with an interest of 1% per month. "The process of tax payment in case of delay is the same as in a normal scenario. You can fill the ITR form online, which automatically calculates the tax payable," say Kumar of PwC. Sudhir Kaushik, co-founder and CFO, Taxspanner.com, an online tax payment and return filing platform, says they have applications which automatically calculate not just the tax liability but also the penalty.